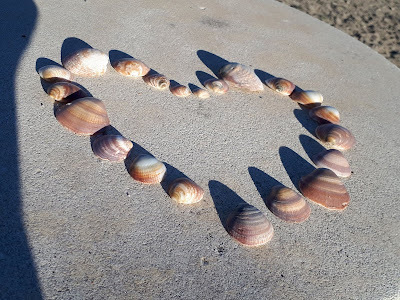 ... and Millie makes three: Spain 2019 - Naturism? Not in January! 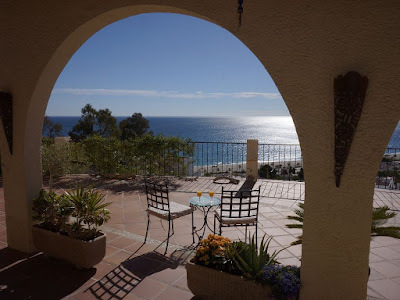 Spain 2019 - Naturism? Not in January! We entertained again today! Liz and Phil, who we met while we were here last year, are also here again – this time for 6 months. It was really lovely to see them and discover what they have been doing. One of the things they have been doing is making the big decision to move out here. They sold their house in the UK back in the summer and have decided to buy a small place in the UK and rent somewhere over here. They are not sure if it will be a permanent thing so renting makes sense. They are flying back to the UK next week for various reasons and will see how it feels to be back there – looking at the UK weather forecast they will be feeling very cold!! It’s a massive decision to make and not one I would even consider. I could not leave my family behind but then we are all different. When we went down to the beach this afternoon there were low clouds over the mountains – the photo doesn’t really show the effect, but it was weird. The mountains behind us are the Sierra Cabrera. In the 18th century, the low mountains were covered with spreading oak forests but today they stand sadly deforested. There are seven Sierra’s (mountain range) in the province of Almeria – we will try to visit each one. My iPad is playing up – the battery is on its way out, I think. Sometimes the battery goes down too fast and then other times it shuts off at about 47% but after about 10 minutes charging it will come back on at 47%! 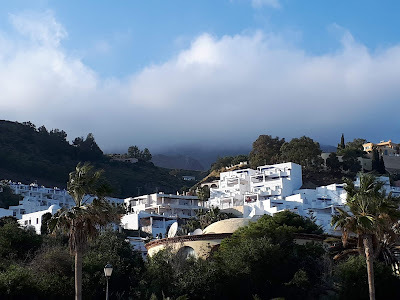 I had asked on one of the Mojacar Facebook forums where I could get the battery replaced and two places in Garrucha were suggested – so off we went. The first place said no they didn’t do it but when I said that I had been told that they did do it I was told to come back on Monday when the technician would be there. At the second place the chap made a phone call and said no. 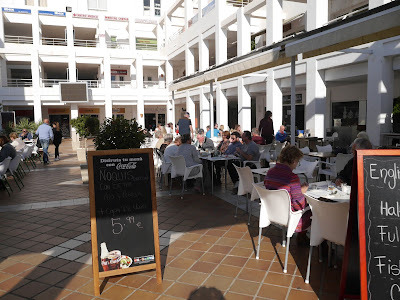 We had a coffee then headed back to Mojacar where a third place had been suggested. This time we were told that they were out of batteries but to go back in two to three weeks’ time when they would have new stock and could then do it. I double checked that they could really do it and was told yes. As we were in the Parque Commercial we had tapas in Masko – I had spare ribs in a barbecue sauce which, on the scale of difficulty to eat, came in about 11 out of 10! In the afternoon we went for a short walk on the beach and I found this pretty shell arrangement on a wall. In the evening there was a tremendous thunderstorm out to sea. It seemed as if it was right outside but there was no rain. Muffin hates loud noises and thunder is one of them. All the bedroom doors were closed, and we found Muffin in the family bathroom shaking – bless him. When Richard wanted him to go outside for his last piddle he did NOT want to go, and Richard had to put his lead on to take him out. We woke up to a cloudy morning – the first time we have really seen clouds. They soon cleared, the sun shone again, and it turned out to be a very warm day. In the morning we went to see a possible rental for next year. We came across it last year but had already put a deposit on Claravista. It is higher up than we are, and, in fact, we can see it from where we are now. The views are amazing, and it is very well equipped. The owners use it a lot, so they obviously have it as a home and not a rental property. The view is amazing, and I think I could be quite happy washing up looking right down to the sea! Both the master and second bedrooms have access onto the patio with their own areas, so it means that visitors will have a view too. The two bathrooms have recently been refurbished and are lovely with walk in showers. It is quite difficult to write a blog when we aren’t doing very much. 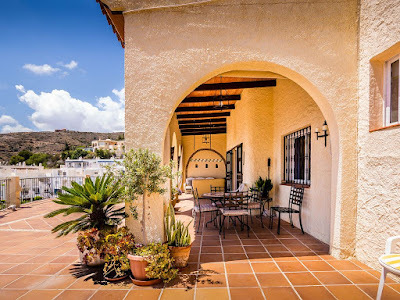 It’s very much home from home and, being here for 2½ months means we can’t treat it as a holiday! We have three lots of guests coming out so then we will be on holiday and take them out to places. Trouble is we might be so busy that I won’t have time to write a blog post! I did a load of jeans type washing and it is so nice to get that sort of stuff dry outside in January! We decided to go to Vera Playa to the supermarket there. It is a big one, but we were good and didn’t buy anything we didn’t need! However, I did want hair conditioner and couldn’t find any – I’m not sure what the Spanish use! Vera Playa is named after the small town of Vera, which lies around 8kms inland from the coast. The nearest town, however, is Garrucha. The Playa is a relatively new resort, which only started to be developed in the 1980s, before which it was pretty much untouched. Legend has it that this is where Hannibal’s elephants landed in the Roman age. It is home to the Vera Playa Club Hotel, the only naturist hotel in Spain and the Playa is hailed as the world’s best naturist beach resort. On July 21st 2013 a local group called Vera Playa Friends organised a Guinness World Record attempt at the largest ever skinny dip. 729 naturists entered the sea at El Playazo beach beating the previous record of 506 set in New Zealand the previous year. On doing some research I found a website of FAQs on Vera Playa. This is one question with its answer! How will I know if I am in the naturist zone? In the summer it will be quite quickly fairly obvious!! And no I didn’t take this photo! !